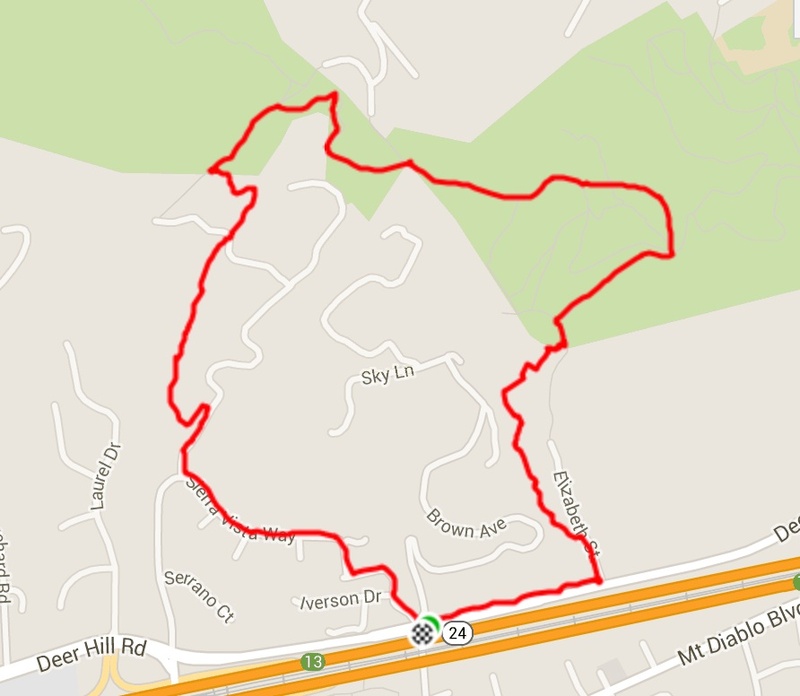 The Lafayette Ridge Trail is one of the most popular trails in Lamorinda due to the convenience of the Lafayette Ridge Staging Area on Pleasant Hill Road, across from Acalanes High School. But what many area residents may not know is that there are a number of Lafayette Ridge “feeder” trails, some named after famous residents, that can be used to create more unusual loops and routes. Start at the Lafayette Ridge Staging Area off of Pleasant Hill Road. Follow the fire road up the hill following the signs for the Lafayette Ridge Trail. You’ll pass an old barn on the left and then reach a junction with the Las Trampas to Briones Regional Trail. Make sure to stay right and keep going up the hill. After a steep section you’ll reach a cow gate. Go through the gate and stay to the left on a single-track trail. This scenic section of the trail runs just above a neighborhood and then brings you to a crest and junction with the Petar Jakovina Trail. Turn to the right on the fire road that runs along the Ridge. Very soon you’ll see two large water tanks up on the hill followed by three large pine trees. Just past the pine trees there is a City of Lafayette trail marker (see picture). Take a right up the hill. If you’ve gone the right way you’ll quickly reach a fantastic bench and view spot under one of the pine trees. This bench is your high point on the hike at about 1000 feet (parking lot is at 367 feet). After a break continue on the trail and right away you’ll reach another bench that looks out over the Springhill neighborhood and beyond (see picture). Follow the trail through a forest of oaks, maples, and bay laurel trees. After about 3/10ths of a mile you’ll reach Leslyn Lane. Take a left down the steep but scenic road. You’ll reach Goyak Drive and then Springhill Road. Luckily the City has recently added a walking path along Springhill Road from this point all the way down to Springhill Elementary School. If school is not in session you can cut through the school back to the Staging Area where you started. The John Kiefer Trail was just named and dedicated to “Papa John” Kiefer on July 27, 2014. John is a local hero, best known for being Lafayette’s chicken expert and offering free chicken workshops every year, but prior to that he was a Parks, Trails & Recreation Commissioner from 1986 to 1994. During that time he supervised the construction of two Lafayette Ridge feeder trails, and also created the Volunteer Trails Maintenance Program in 1995. View article in the Lamorinda Weekly about the creation and dedication of the trail. Difficulty: Challenging. A steep approach to the trail on Sessions Road and then about 75 steps going up the Petar Jakovina Trail and another 75 steps coming down the Las Trampas to Briones Regional Trail. 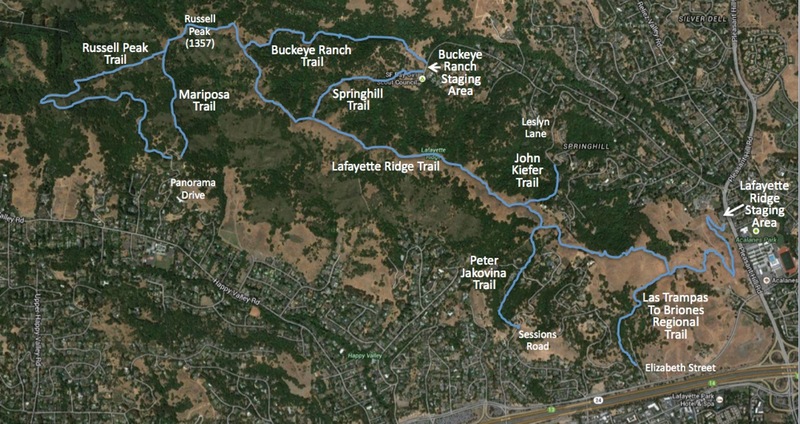 The Petar Jakovina Loop combines the Petar Jakovina Trail and the Las Trampas to Briones Regional Trail into a three mile loop that starts near downtown Lafayette and can be done in either direction. I jokingly refer to this as the “Stairmaster Loop” because both feeder trails include about 75 steps. It’s easier to climb the Regional Trail (from Elizabeth Street), but can be a little sketchy to come down the Jakovina Trail if there are a lot of leaves. If you go up the Jakovina then get ready for a scenic “Stairmaster” workout!! I typically park on Brown Avenue under Highway 24. Cross Deer Hill Road to Miller Drive. Follow Miller Drive to Sierra Vista Way. After about a quarter mile you’ll see a sign for private Sessions Road on the right. Sorry, Sessions Road is steep, but after about 100 yards you’ll see a trailhead on the left. That is the beginning of the trail. Soon after the trail begins you’ll reach a nice bench under an oak tree where you can enjoy the view out over Lafayette and recover from climbing Sessions Road!! The trail traverses a canyon with oaks, bay laurels and buckeye trees and like I mentioned before has about 75 steps. On the way up you’ll cross the upper end of Sessions Road and then continue on the other side. Near the top you’ll reach a fire road where you take a right and continue up to a junction with the Lafayette Ridge Trail. Make sure to take a right on the single-track trail that angles down behind a house. After a third of a mile or so you’ll reach a cow gate where the trail turns into a fire road. At this point you can enjoy great views of Mt. Diablo in the distance! After descending down a steep rocky section you’ll reach a junction. Take a right on the Las Trampas to Briones Regional Trail that heads down the hill. You’ll know you’ve gone the right way when you reach the first of many series of steps. This surprisingly scenic trail descends down through the trees towards Highway 24. When you reach Deer Hill Road, follow the signs to continue along the street back to Brown Ave. where you started. The trail was dedicated to Petar Jakovina in 1996 because he helped make land available for the trail. Petar is most famous in Lafayette for opening Petar’s Restaurant in 1959, calling it “a little bit of San Francisco in Lafayette.” In 1980 he moved the restaurant to Lafayette Circle where it stayed until 2013, and became a popular spot to listen to dance songs by “Diamond Dave.” The site is now occupied by the Cooperage. 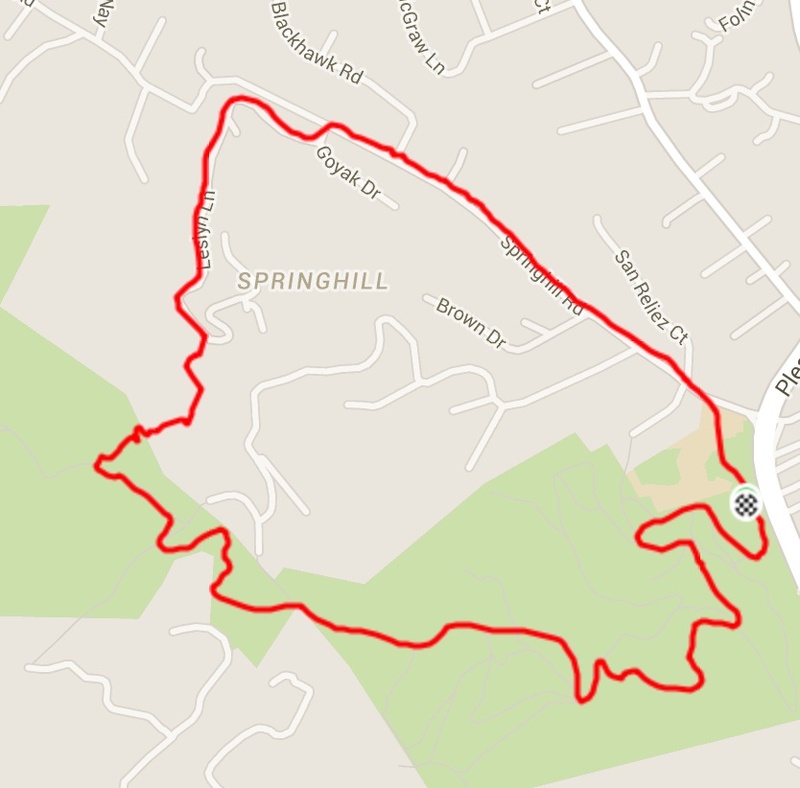 If you live in the Springhill neighborhood you could hike to downtown (for lunch?) by going up the John Kiefer Trail, take a left on the Ridge Trail, and then going down the Petar Jakovina Trail. Take a right on Sierra Vista Way, which will turn into 1st Street and take you by Whole Foods. If there are any other good feeder loops that you’d recommend please comment on this post. Is access to the trails from Elizabeth allowed (The Peter Jakovina loop)? I just tried, and there are a lot of no trespassing and private property signs before the trailhead. I didn’t attempt, although it does appear to be an official and public trail. Any thoughts? Great! I just moved 0.25 miles from there, so accessing the hills through Elizabeth rather than running all the way up Deer Hill towards Pleasant Hill Rd would be a real time saver! I’ll try again tomorrow.